Liquid nitrogen and top-tier ingredients set this boutique ice cream maker apart. 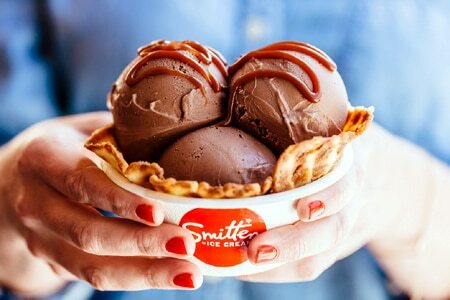 : Smitten Ice Cream is a gourmet, liquid-nitrogen-based ice cream shop with locations around San Francisco and the Bay Area. Ice cream is made fresh --- flash frozen to order by a special machine --- and is noticeably creamy with seasonal, delectable ingredients. Founder is Stanford U. grad Robyn Sue Fisher.